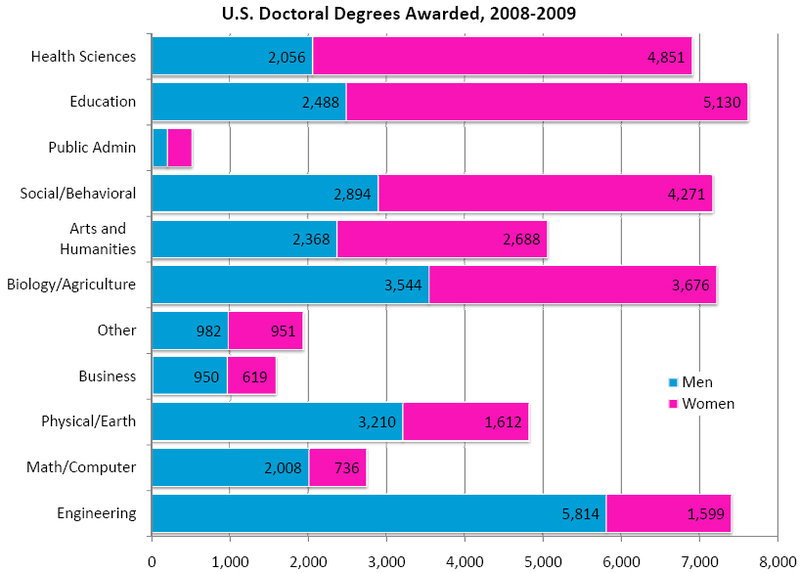 In 2008-2009, U.S. women pulled even with men (+/- a few hundred) in the total number of doctoral degrees awarded, according to stats from the Council of Graduate Schools. Amazingly, women only account for 22% of new engineering PhD’s, which is truly remarkable when you realize that, even at one day old, female infants are significantly quicker at determining that it’s useless to stare at a mobile. Although women are gaining in engineering, math, and physical sciences, they headline is driven by the rapid growth of female PhD’s in health sciences, which now has the highest proportion of women. 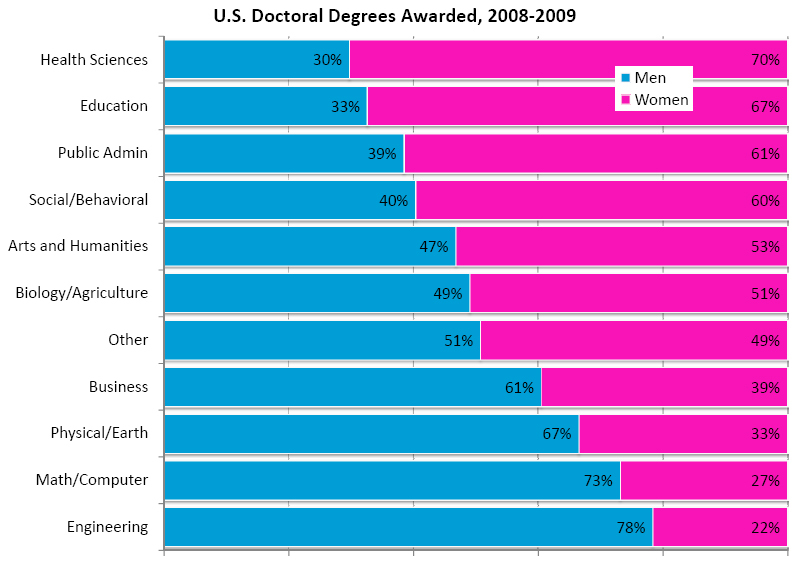 In that area, women’s average annual increase in PhD’s was 14% for the last 10 years, compared with 4% for men. So the increased access to doctoral-level education is not decreasing segregation between fields as much as it could. Overall, the segregation level between fields — very broadly defined into just 11 groups — is 28, which means 28% of men or women would have to change fields in order to even out the gender distributions. That number is comparable to the segregation score for U.S. occupations overall, measured at the broadest level (10 occupation groups). The closer you look, of course, the more segregation you find. Among BA-level degrees, the segregation level is about 35, and apparently rising. In the detailed occupation breakdown, the segregation level is more than 50 (and it is notably lower among those with more education). even at one day old, female infants are significantly quicker at determining that it’s useless to stare at a mobile. OMG–the laughing hurts my side. Please make it stop!